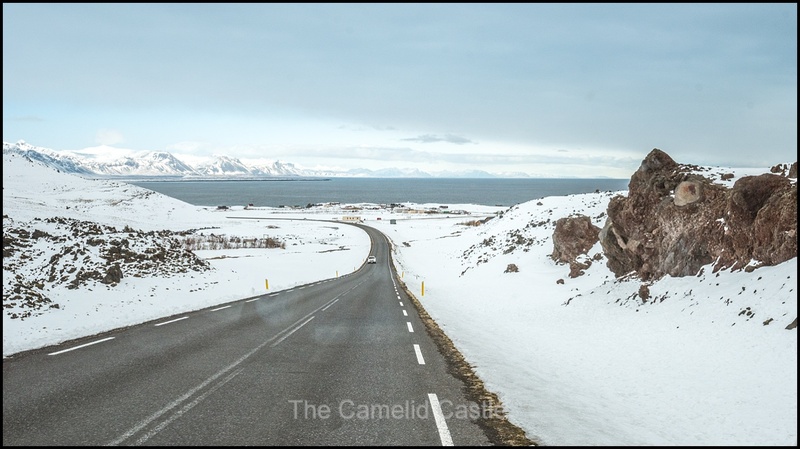 Our first full day of exploring Iceland in the motor home was spent in the Snæfellsnes Peninsula, in the West of Iceland. 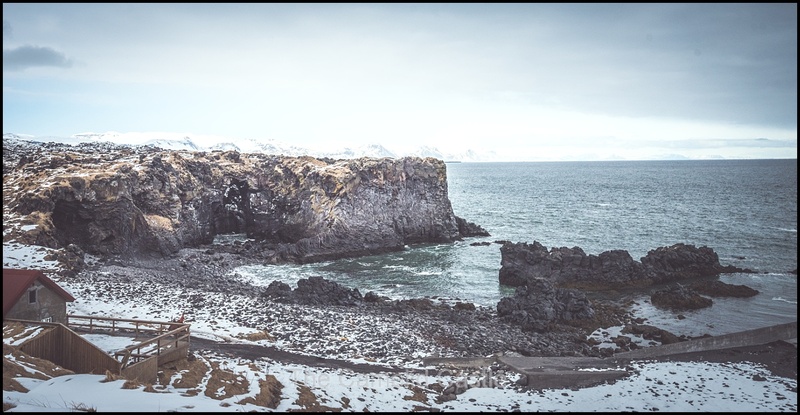 The Snæfellsnes Peninsula is known for its dramatic landscapes and offering a taste of many of the things you’ll see while touring Iceland. 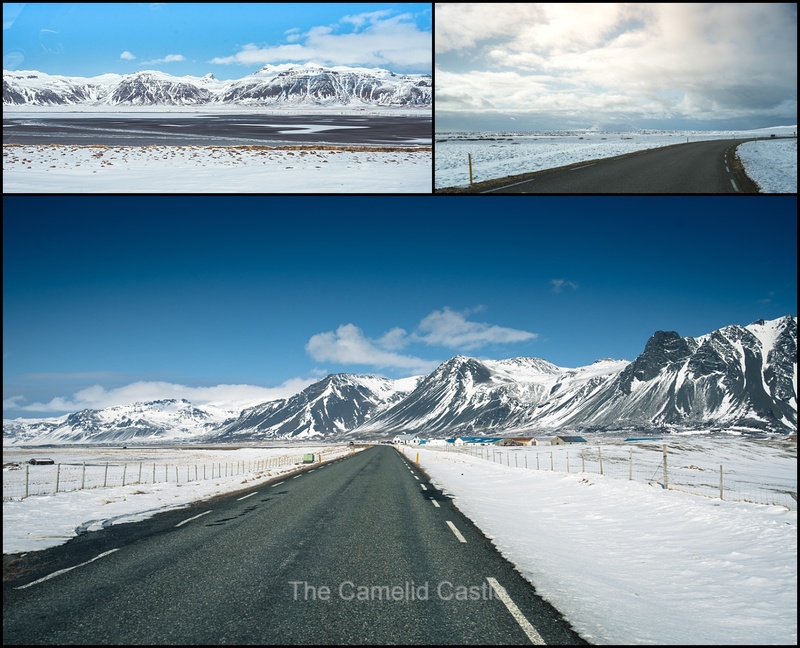 In a day driving the Snæfellsnes we saw plenty of snow, basalt cliffs, dramatic black stone beaches dotted with twisted metal, glaciers, snow-covered craters, dramatic cliffs with nesting birds and fishing villages dotted with colourful houses……. oh and snow, plenty of snow! Our first night in the motor home went pretty smoothly, despite freezing temperatures (it was around minus 8 degrees Celsius) and the fact that we weren’t plugged into site power, we managed to stay warm enough. We ran heating off the motor home gas supply and it kept us toasty warm along with the Scandinavian doonas. We did discover the bed is a little too short for Anto, as I barely fitted, but aside from being a little cosy we all slept fairly well after a long first day in Iceland. With an early sunrise and the time change from Paris and London we were all awake by 5.45am, in time to catch the last of sun coming up over the mountains ringing our campsite. 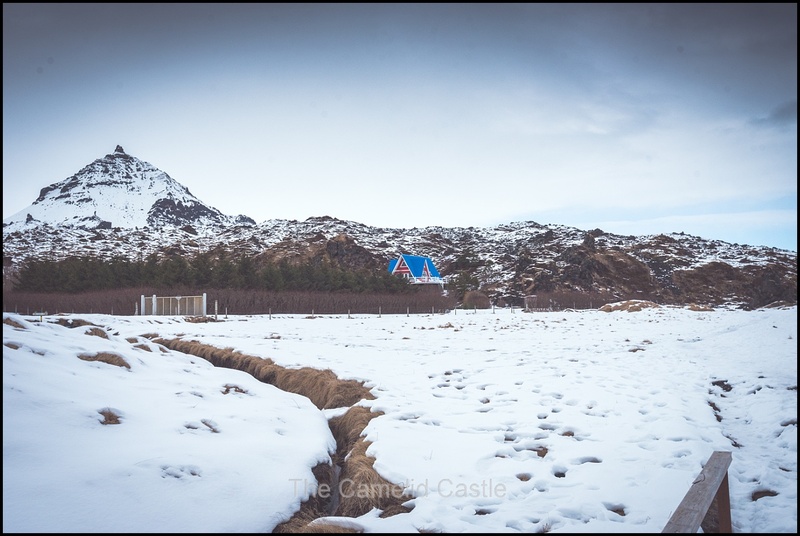 It had well and truly snowed overnight and we awoke to this magical scene……..
Yep, we felt like we were in the middle of nowhere! We did see some (obviously well-cared for) cats wandering out in the snow, and there were people somewhere around, but none of them were bothering us or the serenity. We figured out the protocol for dealing with packing up the beds and clearing space in the kitchen, while Anto cooked some porridge for breakfast. Warm bowls of porridge and treacle made for one of our standard Iceland breakfasts, along with coffee, all the coffee! 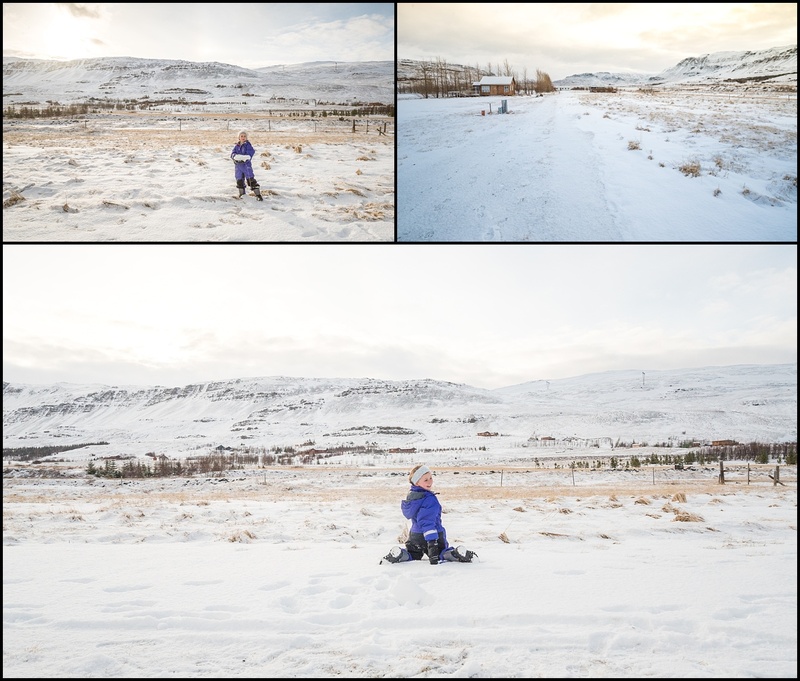 There is limited space inside the motor home so we suited the kids up in their snow gear and let them out to play in the snow while Anto and I cleaned the kitchen and packed everything into ‘driving mode’. This generally involved piling the kids bedding and mattress on our bed, along with the days coats and gloves, putting the car seats back into the driving position, and getting the washing up done so that the kitchen was clean and packed up. A day in, we’d pretty much sorted out where the best place to store things was, and even remembered where different peoples clothes were stashed! The campsite was still deserted and it was alternating between actively snowing and sunny, still about minus 3 degrees. 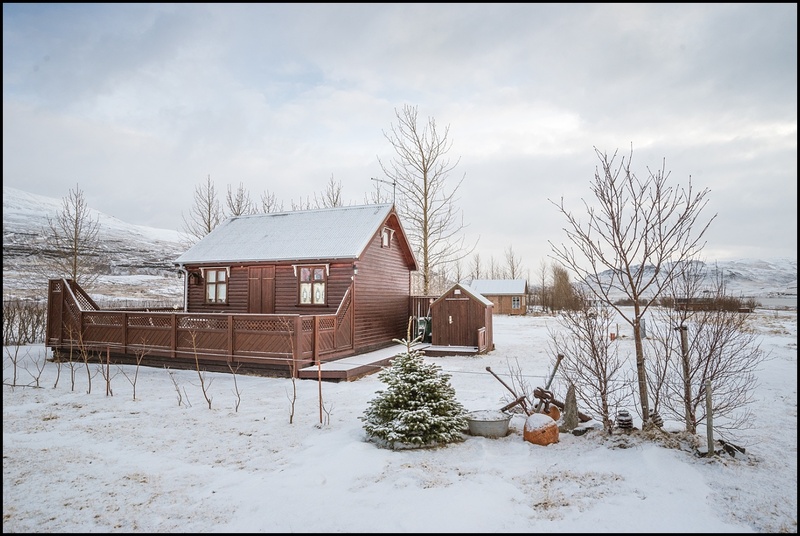 The kids were in heaven playing in the snow and who wouldn’t be happy with this as your morning playground! We did have to eventually drag them inside so we could get moving for the day. We had found a hose attached to the camp water supply but it was frozen solid so we weren’t able to refill our tanks. At this point we weren’t concerned so didn’t think to use some of our tank water and boil it in the jug to unfreeze the hose. Why use water to get more water we thought? This turned out to be a mistake as it was days before we found water again. Day 2 of our motor home adventure though and we hadn’t yet ironed out the kinks in the process. 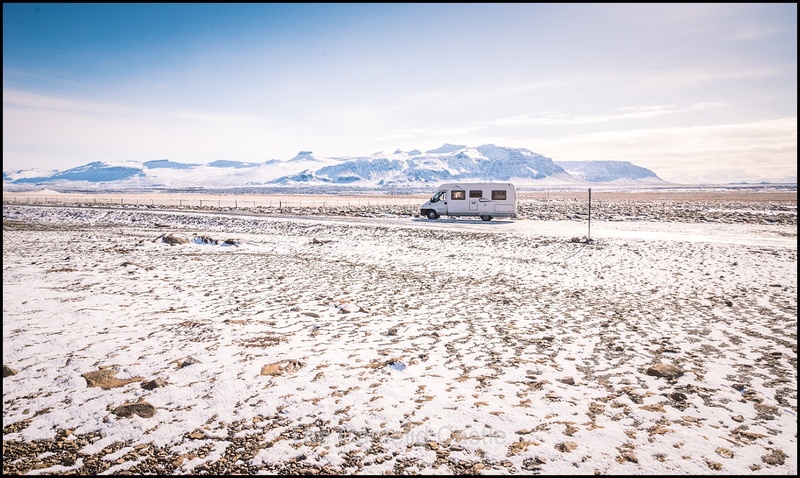 For example, we hadn’t thought to reverse the motor home in the night before, and with a reasonable amount of overnight snow we were a little concerned about our ability to get out of the parking spot! With some luck and Anto’s reversing skill we didn’t get snow bogged, and were off and moving for the day, all a little worried about what snowy and terrifying driving was awaiting us. 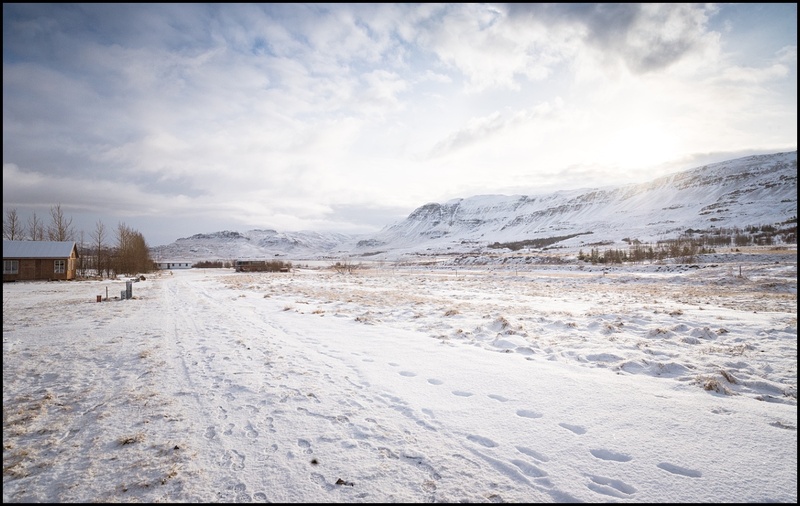 Luckily we did not have to go back over the gravel and snow-covered mountain we’d taken on the way in, and were heading out in a different direction, towards the town of Borgarnes and onto the Snaefellsnes Peninsula. The initial roads weren’t great but the landscape was dramatic. Soon we rejoined the ring road and were heading in the direction of the Peninsula. It had been less than 24 hours and we were still captivated by the landscape. I don’t think I’ve ever taken so many photos out the window while travelling. I would barely put the camera down and something else amazing would appear in front of us. Luckily there were very few other vehicles and no trees, so window photo taking was not too difficult! This worked well since there were often limited places to stop. Our first stop was in the town of Borgarnes where we got fuel. With often very long stretches between towns we planned to fill up on diesel as often as possible. Luckily there were petrol stations pretty much everywhere. Most were not manned and often just had a pump or two. You didn’t need to deal with another human, pay at the pump and credit card was the way to go. With the price of fuel and food in Iceland our credit card was going to be crying pretty soon. Despite Borgarnes having several service station options, none had water hoses on, so there was no water refill option at this point. Once the ‘Bonus’ (discount chain) supermarket finally opened at 10am we grabbed a few more supplies and some milk. Borgarnes is on the edge of the Peninsula and had quite striking views of nearby mountains. 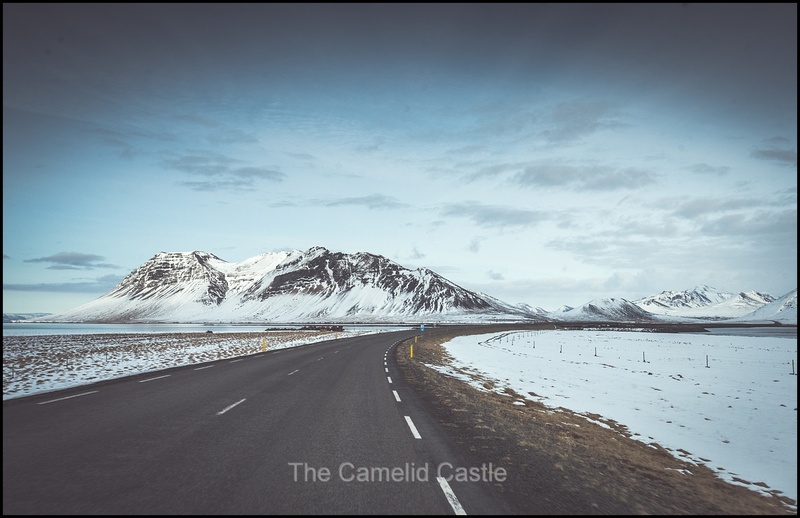 The Snaefellsnes Peninsula is 90km long and we were heading around in a clockwise direction, before heading further North that evening to our next campsite. 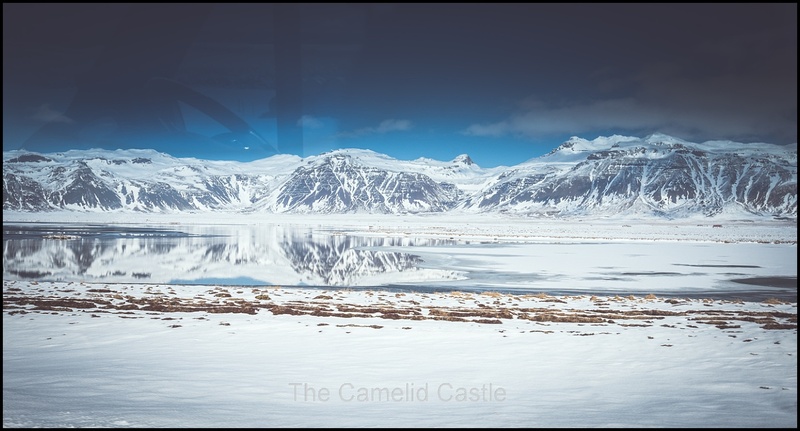 The Peninsula is easily reached from Reykjavik, and while it’s far less touristy than the ‘Golden Circle’ attractions in the South of Iceland, quite a number of day and 2-day bus tours visit the peninsula. 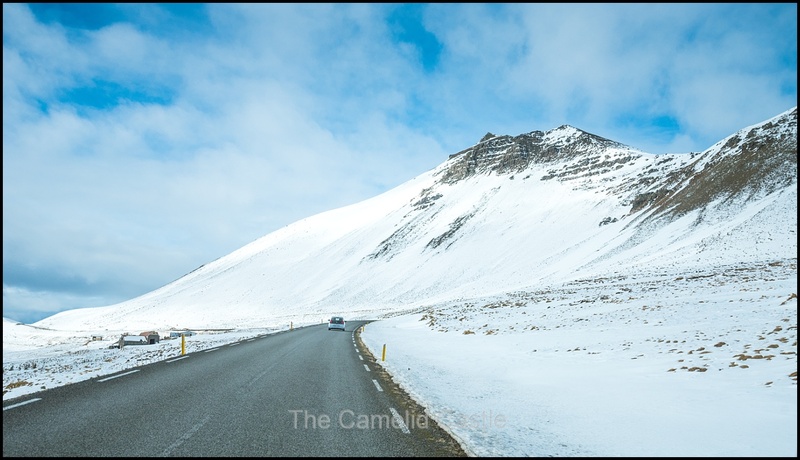 Even being in a relatively touristy spot we had the roads pretty much to ourselves and as we travelled on there were more spectacular mountains and plenty of snow…….. 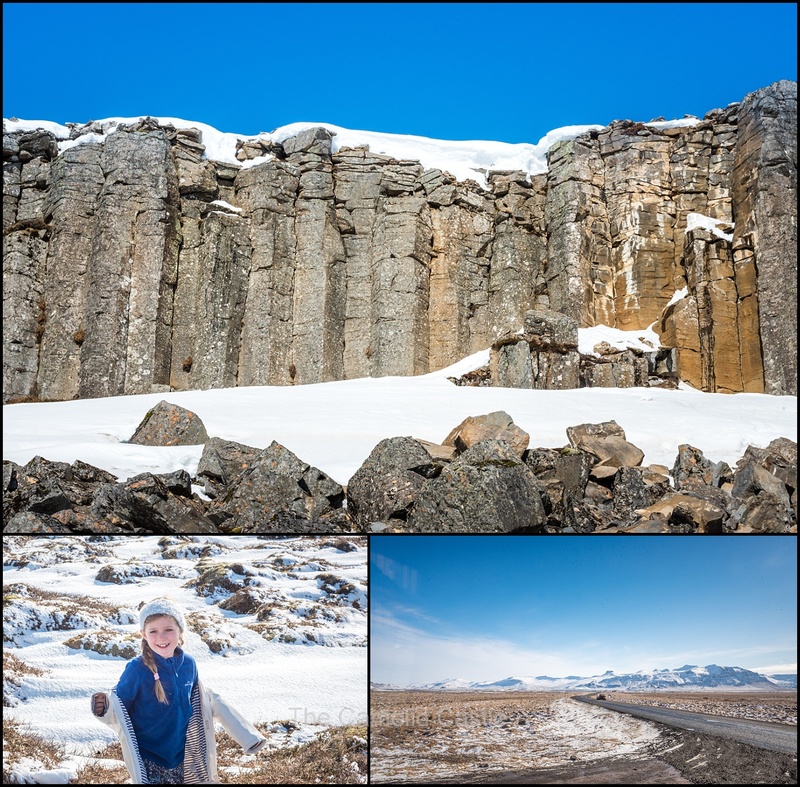 The first stop was to be the Gerðuberg basalt columns, 45 minutes drive from Borgarnes. Despite it still being early in the day Soren fell asleep on way to cliffs. It’s only a short drive off the ring road to the cliffs, and they are impressive even from a distance. 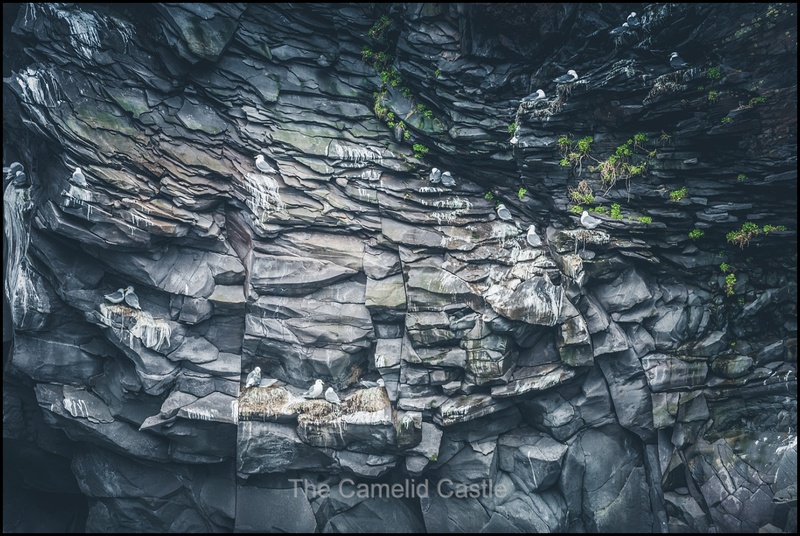 The basalt columns are hexagonal in shape and are formed when lava cools (basalt is volcanic igneous rock). They are pretty amazing to see! Soon we bid the columns farewell and hit the road again. 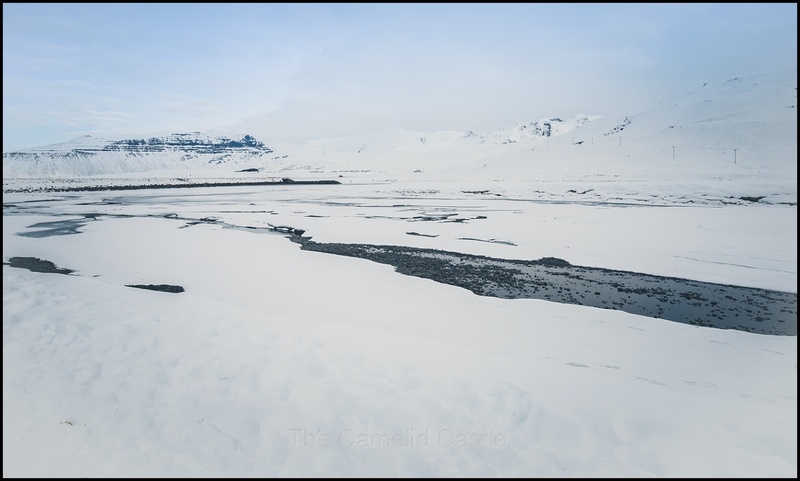 Despite it being rather chilly, we’d been blessed with beautiful clear skies and low wind and the road side scenery was impressive, with no shortage of snow, frozen ponds and lakes and some Icelandic geese. We had another 45 minutes of driving before our next stop, the Budahraun Lava field with the Budaklettur crater (of 88m) in its centre. The lava was deposited around 8,000 years ago and the fields are home to a variety of mosses, ferns and wildflowers. Of course in April, it was covered by snow! You can hike out to the crater but the snow was rather deep in sections so we decided to take some photos from the viewing area rather than end up in snow to our waist. 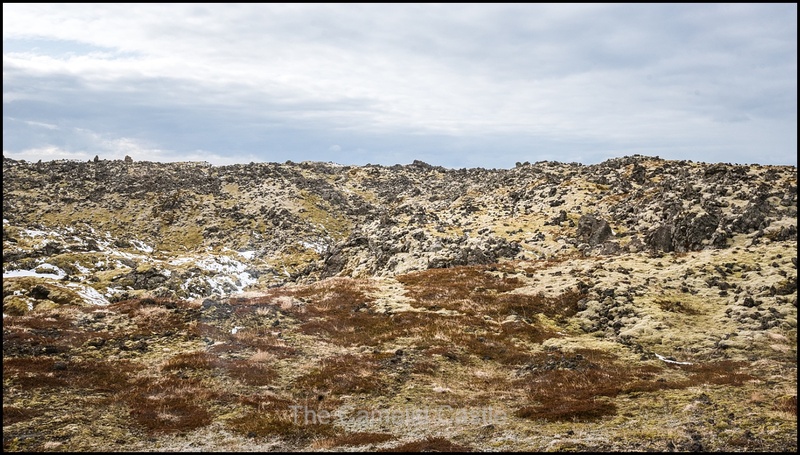 Iceland has no shortage of craters so we decided we’d hike some later in the trip and head to our next destination for some lunch as our tummies were rumbling….. 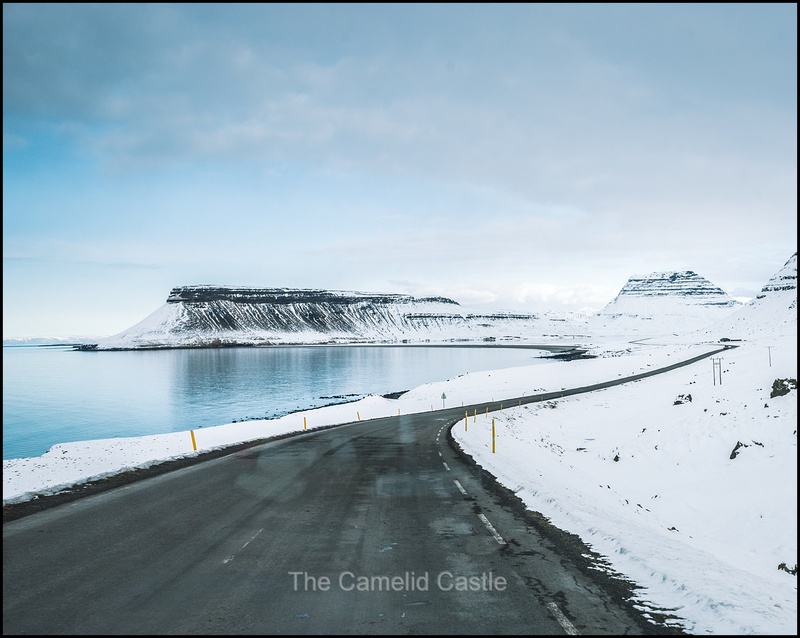 It was 15 minutes down the road to our next stop, the village of Hellnar, yes this is what you drive through when on the Snaefellsnes Peninsula, amazing scenery everywhere, the kids were over being impressed but my camera still got a work-out! 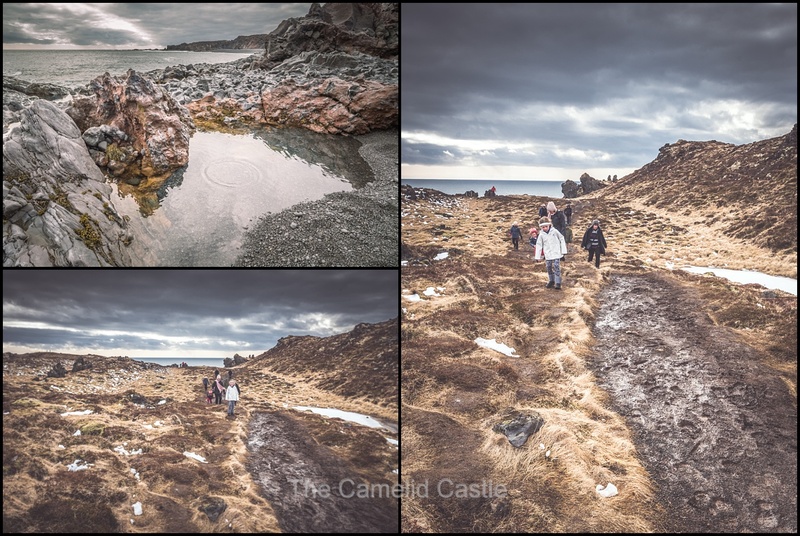 When we reached Hellnar we parked at the top of the cliff in the main car park and made toasted sandwiches for lunch while we watched the variety of sea birds circle the cliffs where they nest. It was a very musical accompaniment to our lunch and the views were fairly breathtaking. The top photo is our lunch view and the second photo shows our motor home parking spot! It was freezing and windy outside but we had some warm food in our bellies (and Astrid was minus another loose tooth) so we decided to do the short hike down to the beach to check out the stone arch and the nesting birds. 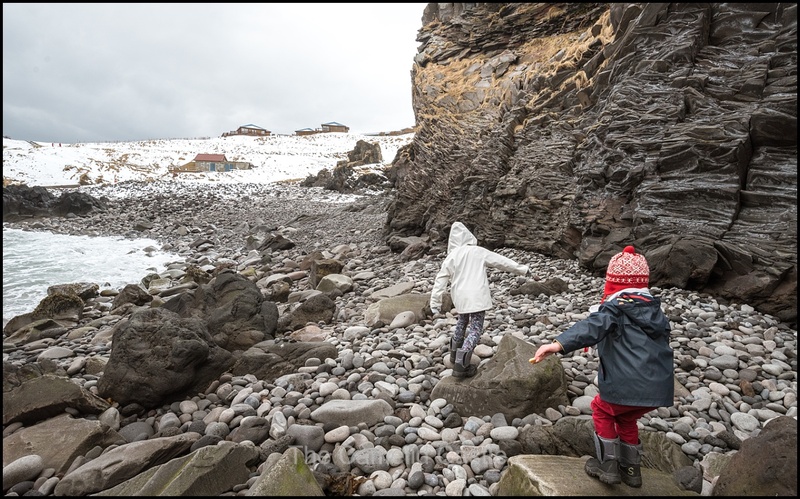 The beach consisted of very large rocks and pebbles (with a liberal coat of snow) so it was difficult and slippery walking, especially for the kids but none of us ended up on our bottoms! Once you arrived at the stone arches it was apparent there were thousands of birds and there was certainly a cacophony. When you get up close you can see the birds jammed into the crevices of rock, nesting and it was a rather amazing sight. 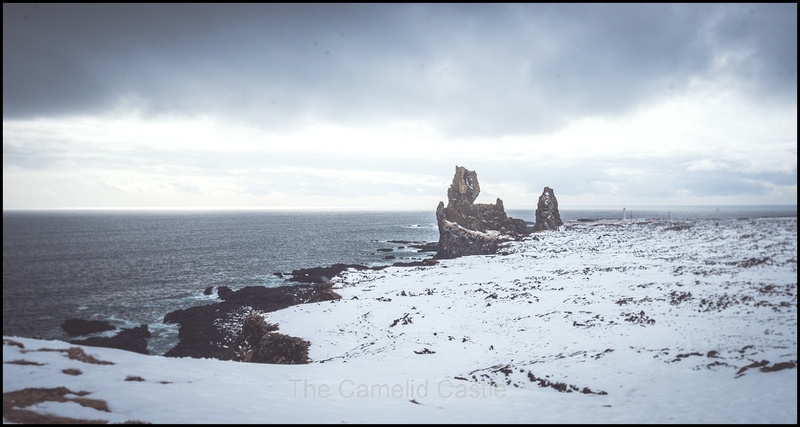 You can walk from Hellnar to the nearby village of Arnarstapi. The first section of the walk is on boardwalk and despite the wind being bitterly cold we’d figure we’d go a little of the way. The walk is 2.5km each way and it was both freezing and there was a lot of snow, but the scenery was too impressive not to hike a little of the trail before returning to the warmth of the motor home. At the end of the boardwalk the snow was too thick to continue safely so we returned to the motor home and decided to drive down to Arnarstapi. 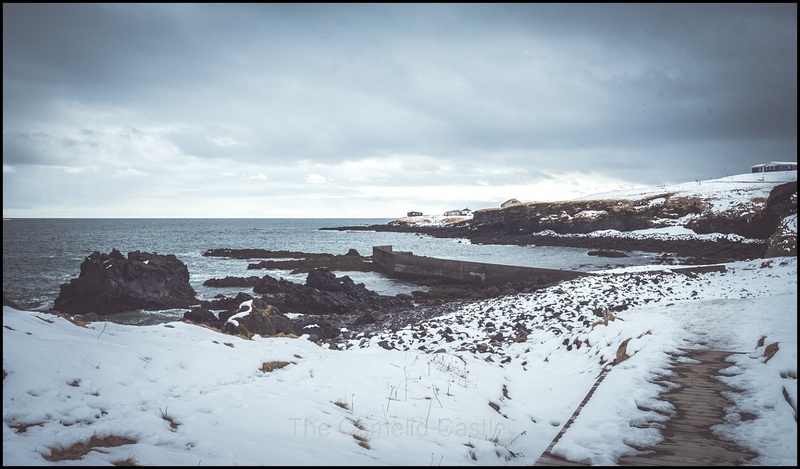 Arnarstapi was well and truly on the mini-bus tour list and we were always battling to find a spot to park in the small and snowy car parks. It was a pretty village on the edge of the peninsula, with impressive views of the mountains and seas. By now the wind was howling and it was somewhat arctic outside so our stops were quick. The Arnarstapi stone pile was certainly impressive. You can see in the photos how big it is by the tiny humans hiking next to it! 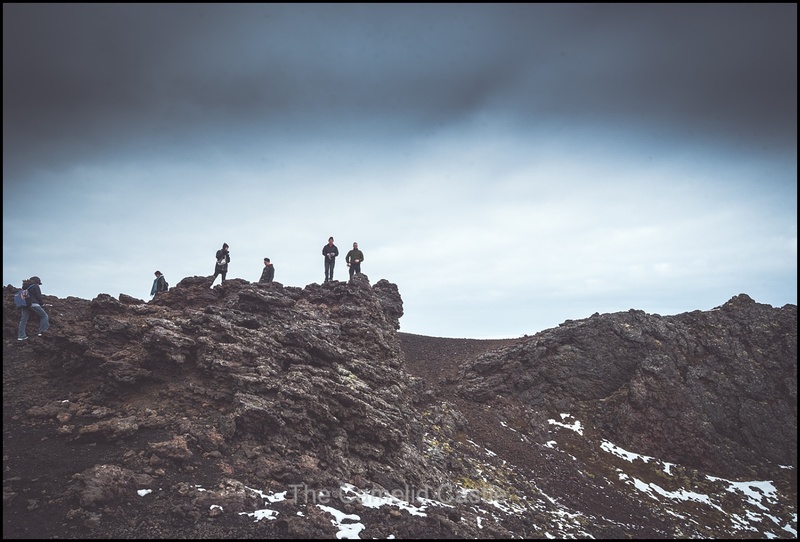 Our next stop was only 10 minutes down the road at the Lóndrangar lava formations. 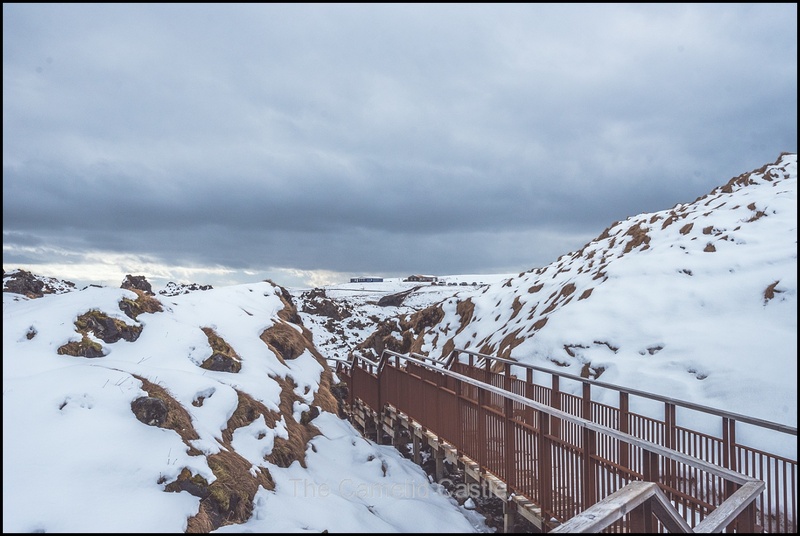 Unlike earlier in the day, some of the lava fields were less snow-encrusted so we managed to see the piles of volcanic rock and moss as we approached the parking area for the cliff side walks. There was plenty of moss and heather, but definitely no trees! 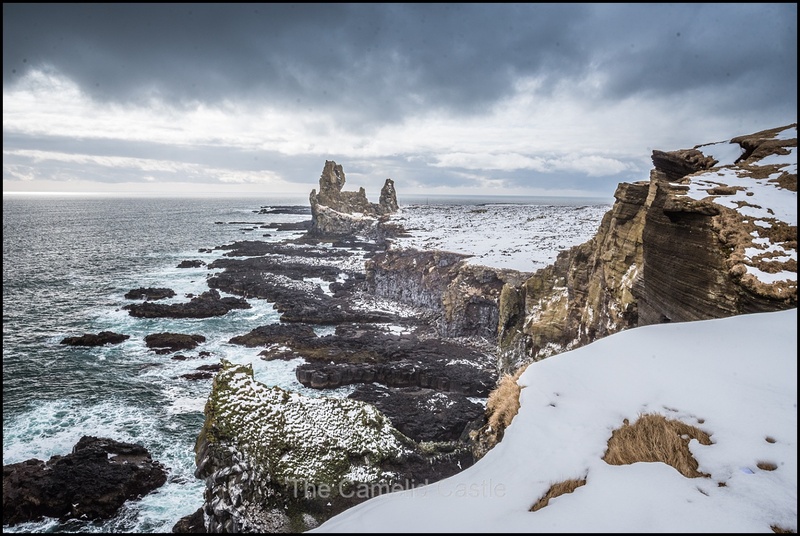 Lóndrangar are two rock pinnacles that strike out from the ocean east of Malarrif and west of Þúfubjarg in Breiðavíkurhreppur on the Snæfellsnes peninsula (yes Icelandic place names are unpronounceable at times). These uniquely formed basalt rocks are considered to be old remains of a crater which has mostly eroded away. 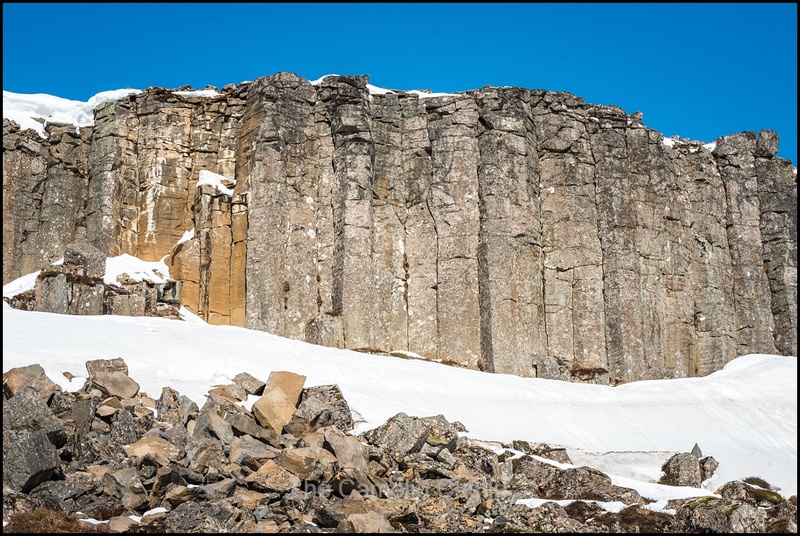 The higher rock is about 75 meters high and the smaller one is about 61 meters high. It was now late in the afternoon and a storm was approaching (and it was still freezing). The stormy sky just added to the beauty of the cliffs. 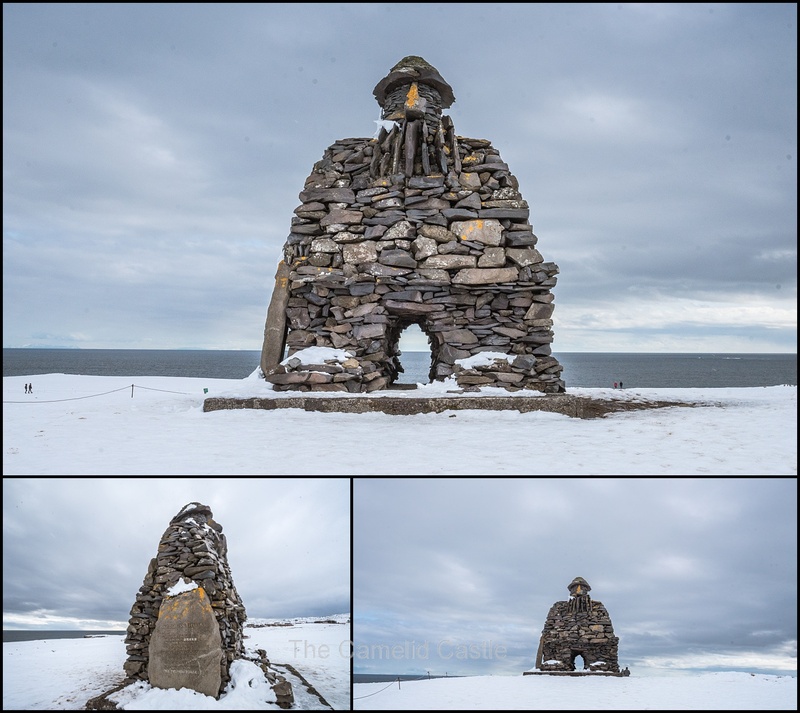 The Lóndrangar are home to many seabirds including the famous puffin, fulmar, common murre and kittiwake, although much to the kids disappointment it was still a week before puffin nesting season. There was a marked trail along the cliff edges, which was not too slippery in parts. There were very low ropes along the edge, again to protect the environment from tourists, not tourists from plunging to their death! Luckily the kids are very good at holding hands at all times. 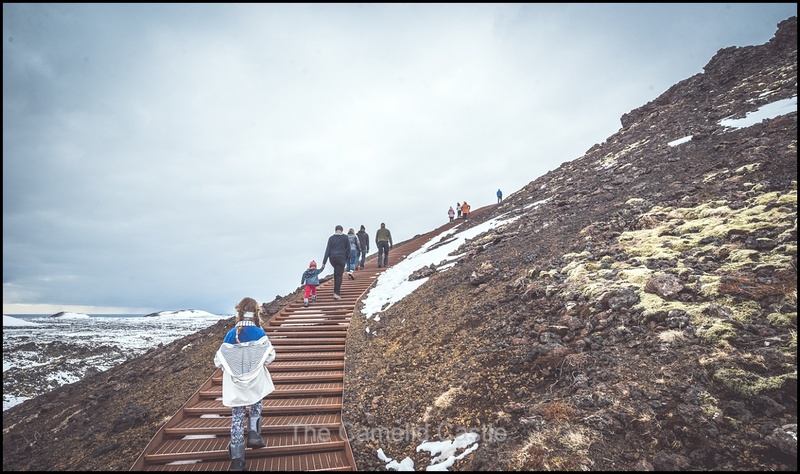 We survived the cliff top walk (which was well worth the terror for the stunning scenery) and were back to the motor home for another 10 minute trip to our next stop Djúpalónssandur or the Black Lava Pearl Beach. 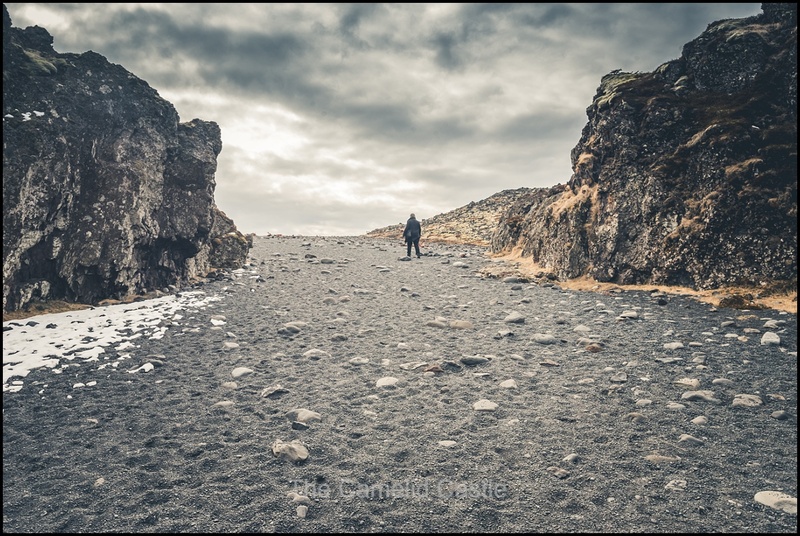 Soren had been talking all day about the ‘black sand beach’ and couldn’t wait to get there. 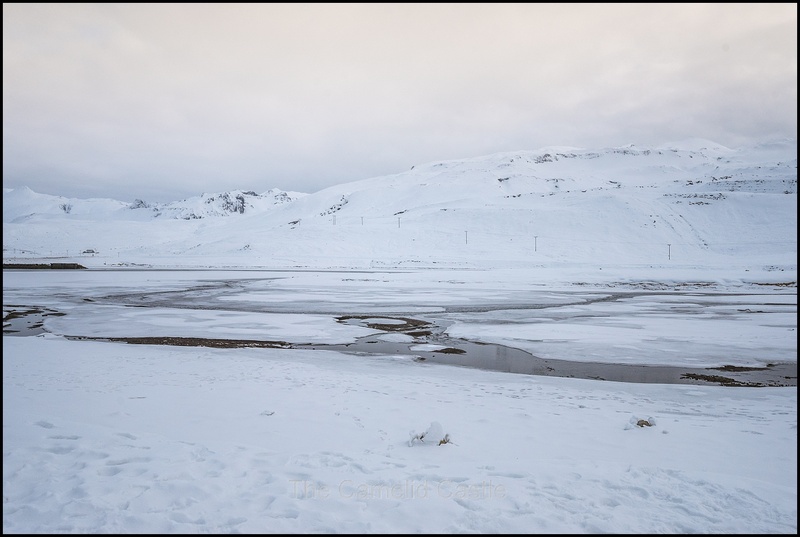 There are 2 freshwater lagoons at Djúpalónssandur, both were frozen in April, which gave the kids endless amusement with skimming stones across the ice. 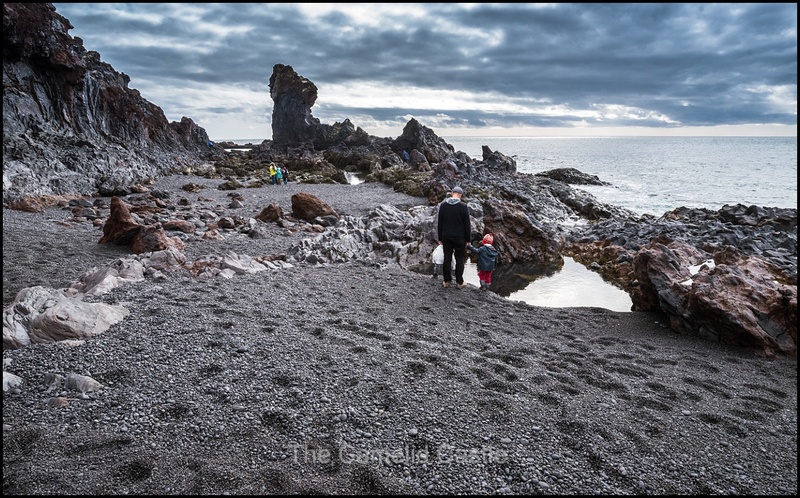 The black sand was more of a gravel consistency with larger pebbles and rocks scattered throughout. 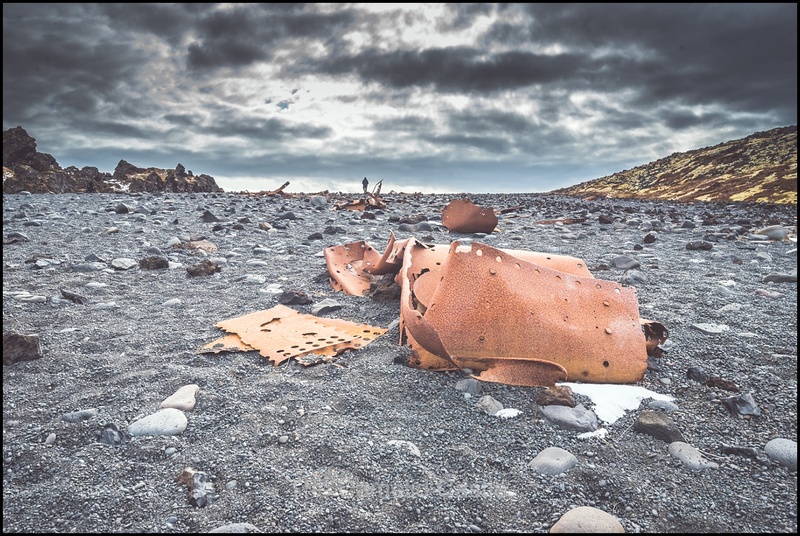 On the beach, there are also twisted iron pieces from the British trawler, The Epine GY7, which was wrecked east of Dritvík cove on the night of 13th March 1948. 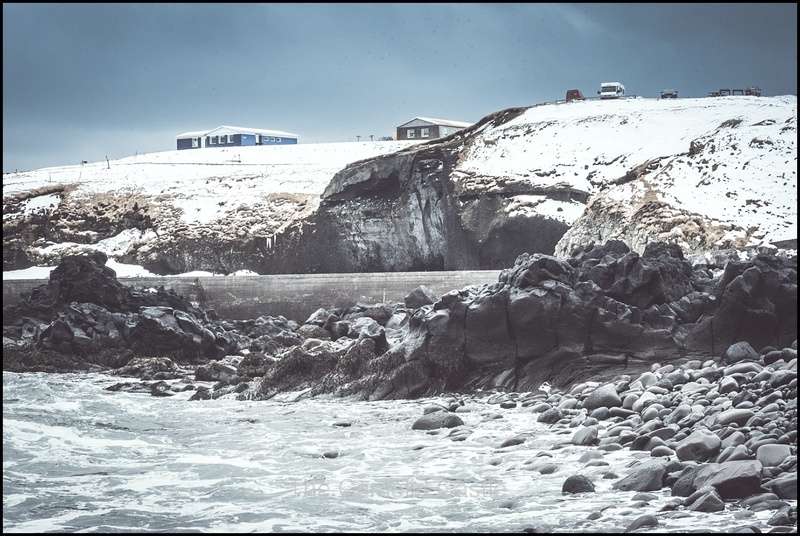 Fourteen men lost their lives and five were saved by the Icelandic rescue team in the neighbouring villages, which managed, after two long and cold hours, to get a line to the trawler. 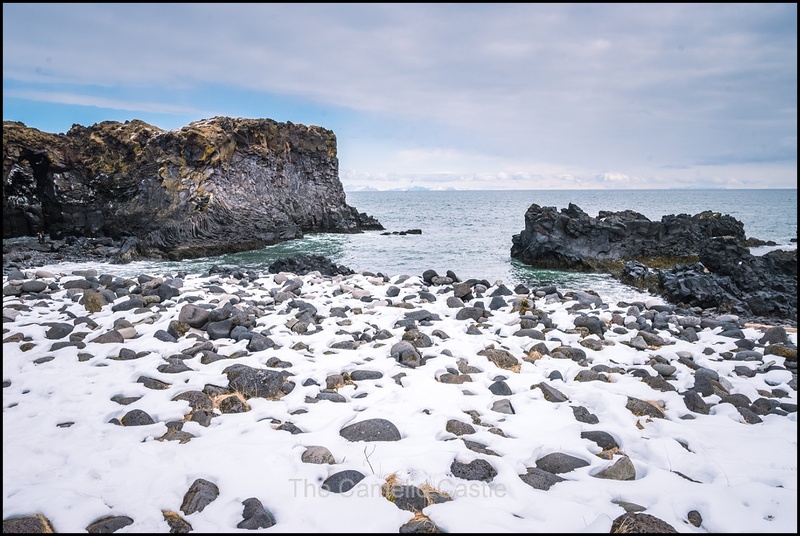 On the Djúpalónssandur beach there are 4 differently sized stones. They are well-known Aflraunasteinar – Steinatök or lifting-stones. They were used to measure the strength of fishermen in Iceland and you can try your strength on these stones yourself. They were all bigger than Soren though! The biggest stone is called Fullsterkur – Strong and weights 154 kg and only the very strong can lift that one! The second one is called Hálfsterkur – Half-Strong and weighs 100 kg. The third one is called Hálfdrættingur – Half as good and weighs 54 kg, and the fourth one is called Amlóði or Lightweight and weighs 23 kg. All these Icelandic names refer to how strong/weak the person is lifting them up on a plinth. 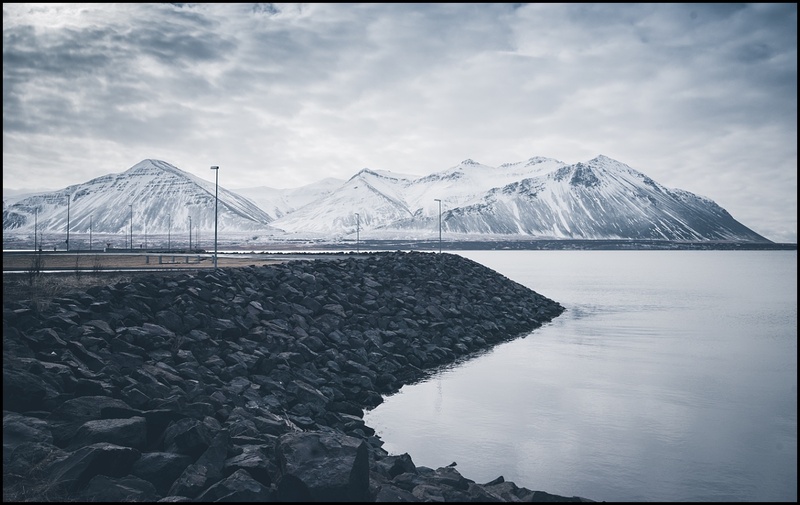 If the fishermen could not lift Hálfdrættingur (54 kg) they were not accepted as oarsmen on the fishing boats rowing from Dritvík. 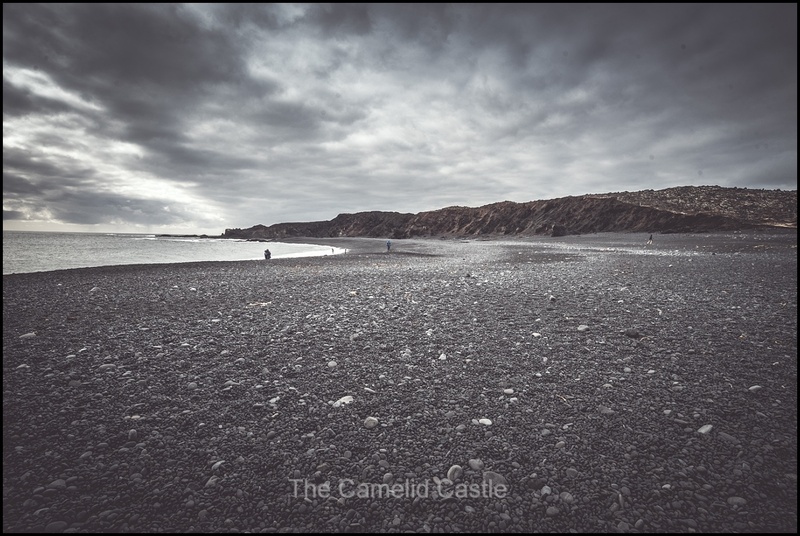 The black sand against the stormy sky was dramatic. This beach is known for its dangerous surf and ‘sneaky waves’. Many tourists have been killed here. We visited another beach in Southern Iceland later in the trip that was even more dangerous than this one! 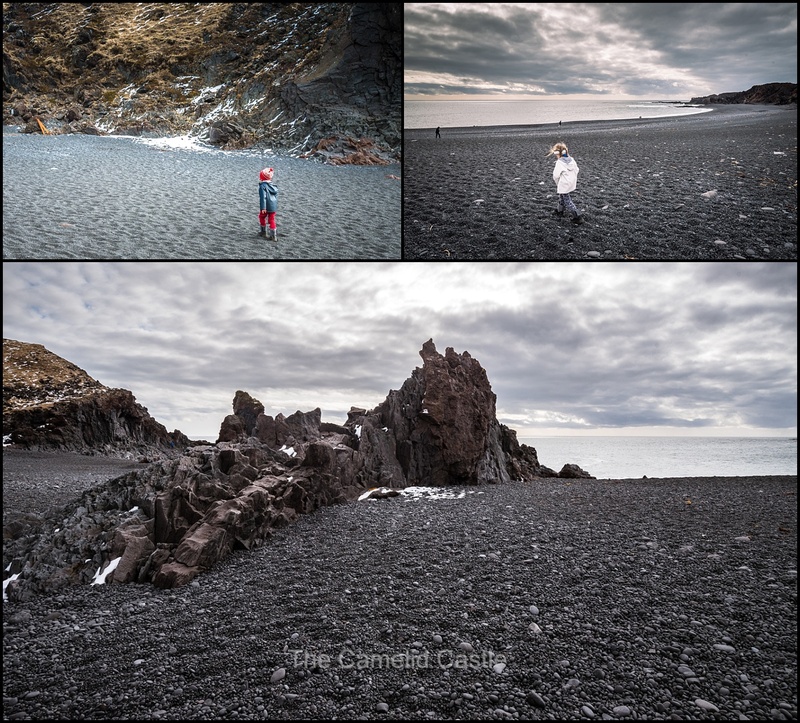 Beaches in Iceland are most definitely different to beaches in Australia…….. The kids loved the rock pools and wandering through the sand. They would have stayed for hours (despite the freezing temperature) and Soren had a bit of a tantrum when we suggested we had to leave as there was still a lot of our agenda for the day and we were a long way from camp. 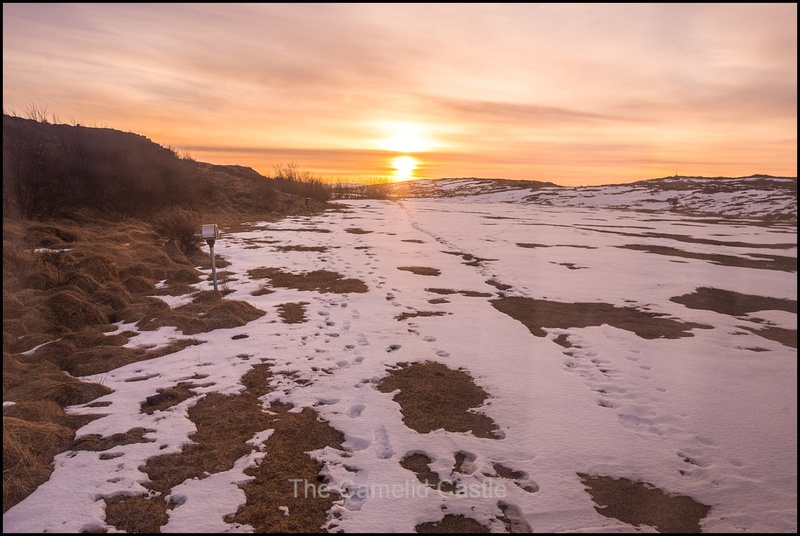 It was getting late in day, at after 4,15pm but we way out on the western edge of the peninsula, and there were no open campsites nearby, and lots of things still to get through on our agenda so we pressed on. 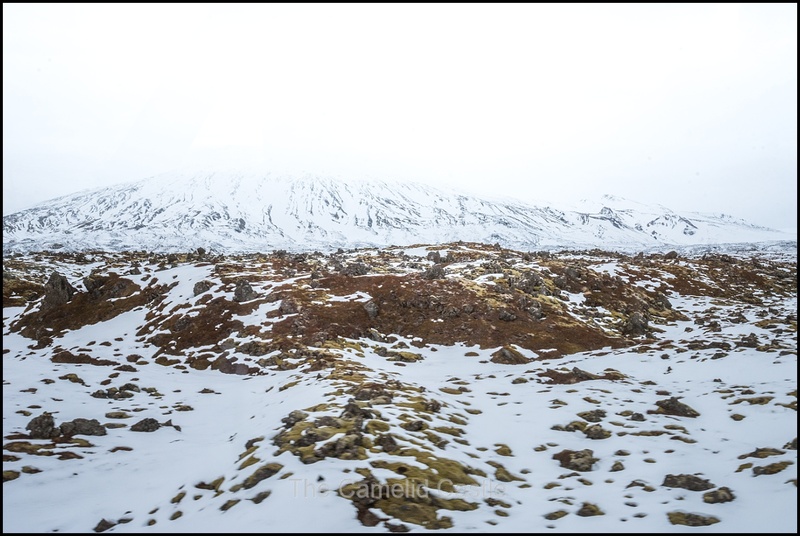 It was only a 15 minute drive to the Saxhóll Crater, our next stop. 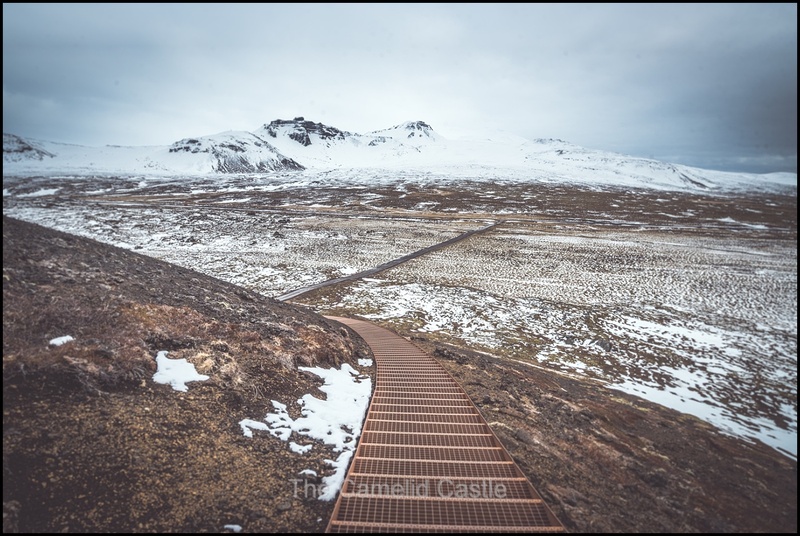 The Saxhóll Crater is in the Snæfellsjökull National Park with wonderful views of the surrounding lava fields and volcano. 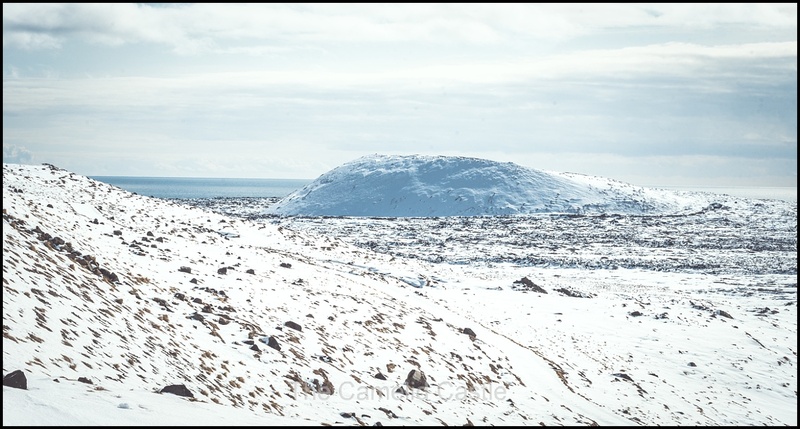 The Saxhóll Crater is estimated to have erupted 3,000 years ago, and much of the surrounding landscape is the result of that eruption. 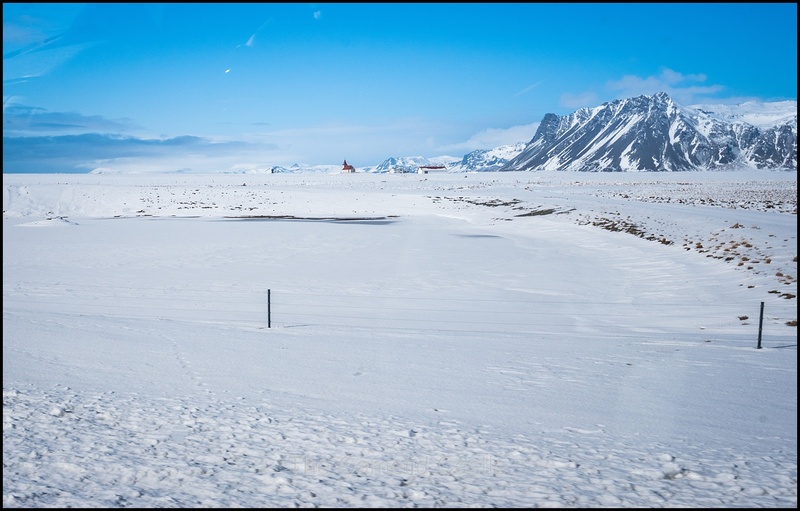 The collapsed core of the crater is fairly deep, and the rim around the crater offers 360 degree views of the surrounding terrain of Snæfellsjökull National Park. We arrived to an extremely muddy car park but did our best to keep our boots clean and hiked up the metal steps to the crater rim which sits 109m high. The views were rather spectacular and worth freezing for! 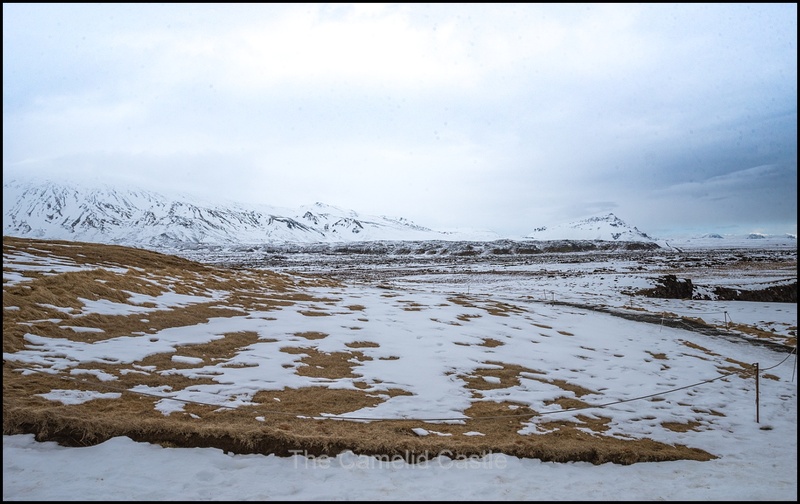 Back to the motor home, doing our best to avoid mud and getting bogged, and we were off to our next stop at the Kirkjufellsfoss waterfall, one of the iconic sights of Iceland. 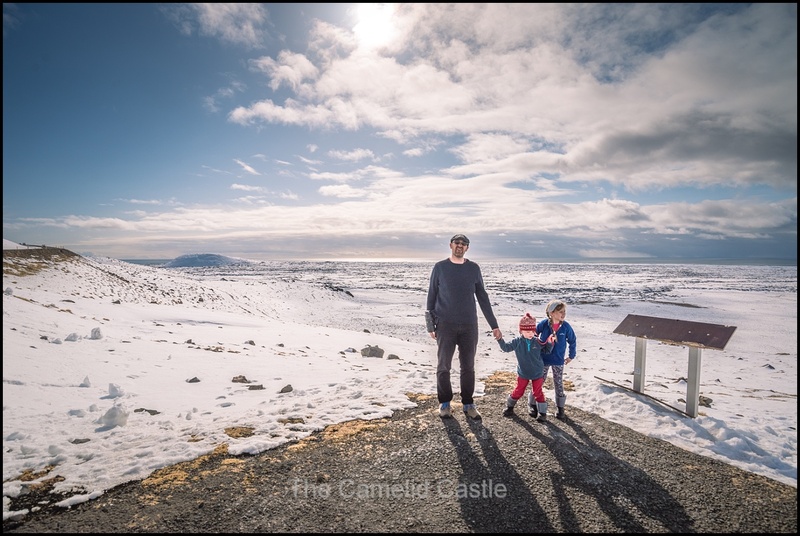 It was 40 minutes drive to Kirkjufellsfoss and the kids were getting rather tired, so we had them spotting Icelandic horses to keep amused. When we arrived at the falls the tiny car park was packed. 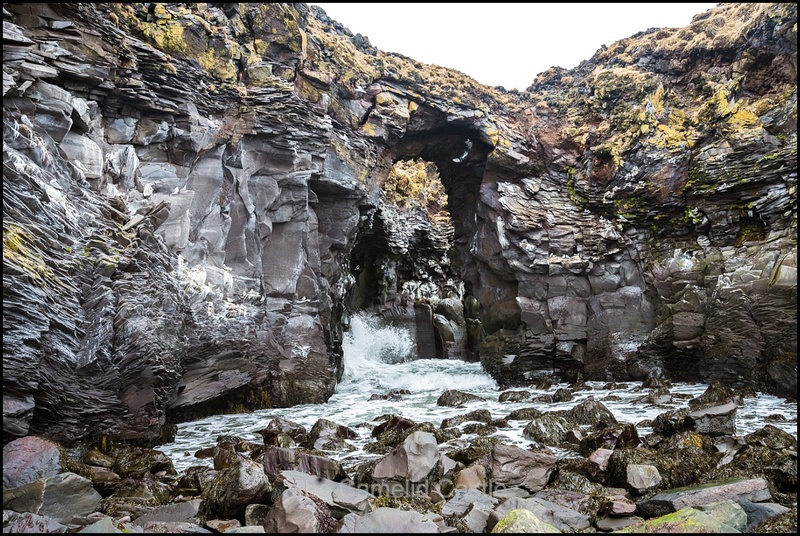 The falls are situated in the Kirkjufellsa river and located near the mount Kirkjufell by Grundarfjordur town at the northern side of Snaefellsnes peninsula. This five meter high fall flows in a couple of levels and is divided into three separate spouts. 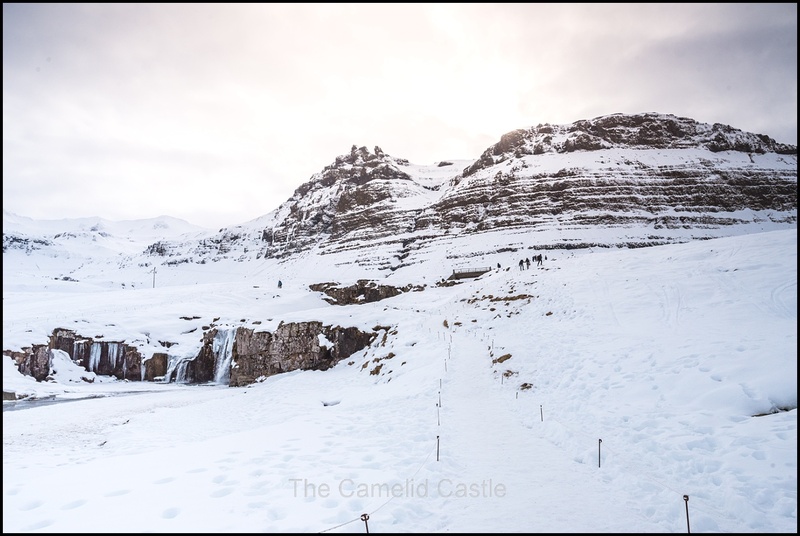 From the falls you can see the pyramid- shaped mount Kirkjufell towering above, one of the most scenic and photographed in Iceland. The snow was quite thick surrounding the falls, and the river and falls frozen. The walk up was very icy and extremely slippery. 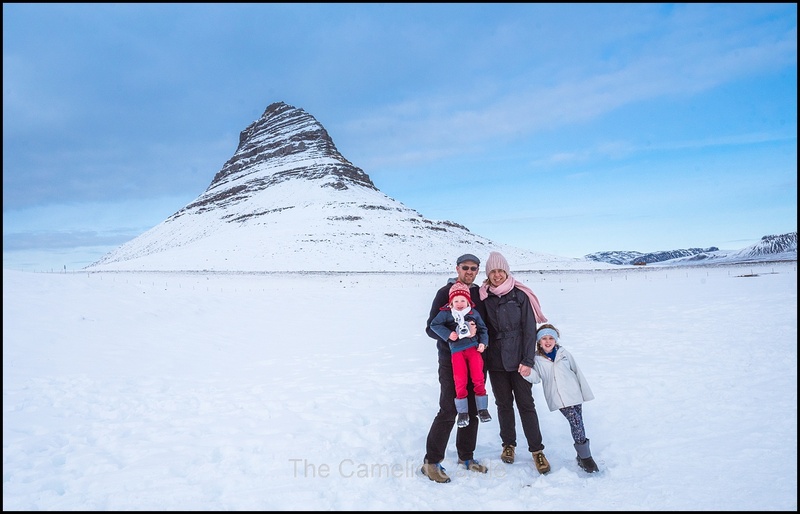 There are often Icelandic horses you can pat at the top of the falls but we could see they weren’t there today and the kids were struggling with the icy conditions so Anto hiked up for a few photos and we captured ourselves with Mount Kirkjufell. When we got back to the motor home we’d been parked in by a tour bus. It was now after 5.30pm and we were tired and cold so the 20 minute wait for the bus driver to return so we could get out of the car park was not appreciated! We had another lava field on our itinerary for the day but having already seen 2 (with more to come later in the trip) we were happy to skip it and head for camp. We had several campsite options and all were a fair drive away. Everyone was weary and we still hadn’t found water. 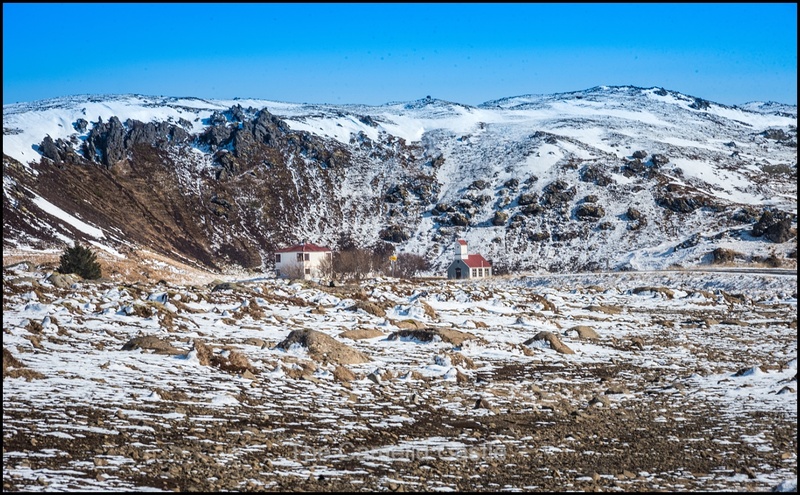 Luckily the scenery continued to impress, with frozen waterfalls and snow-covered mountains visible from the road. The kids were exhausted and we considered finding somewhere to stop and make dinner and finishing the drive later while they slept in their car seats. We seemed to have left civilisation again and while the views were breathtaking, anywhere to stop was not forthcoming. At this point the Sat Nav went crazy and the drive time got longer. Pretty soon we were going in circles. It was at this point we figured out the best way to navigate is not rely on a Sat Nav alone and also started running a google map off Anto’s phone, hoping one of them would get us to the camp site. 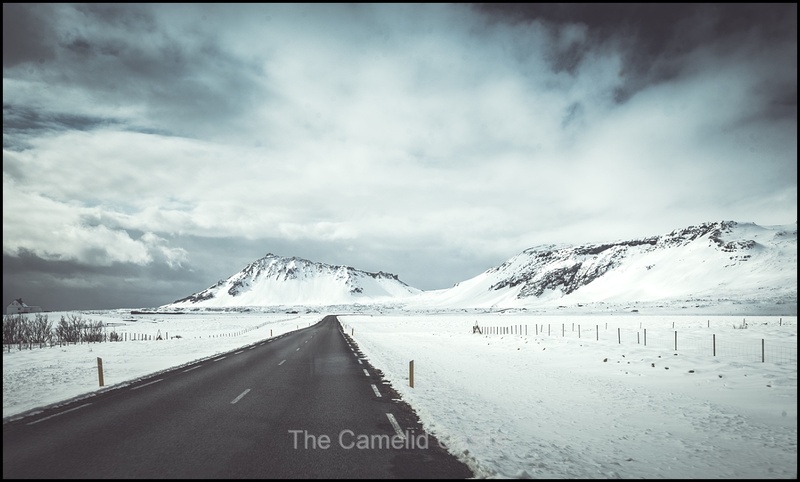 Soon, both landed us in the town of Stykkisholmur and had us literally driving in circles. 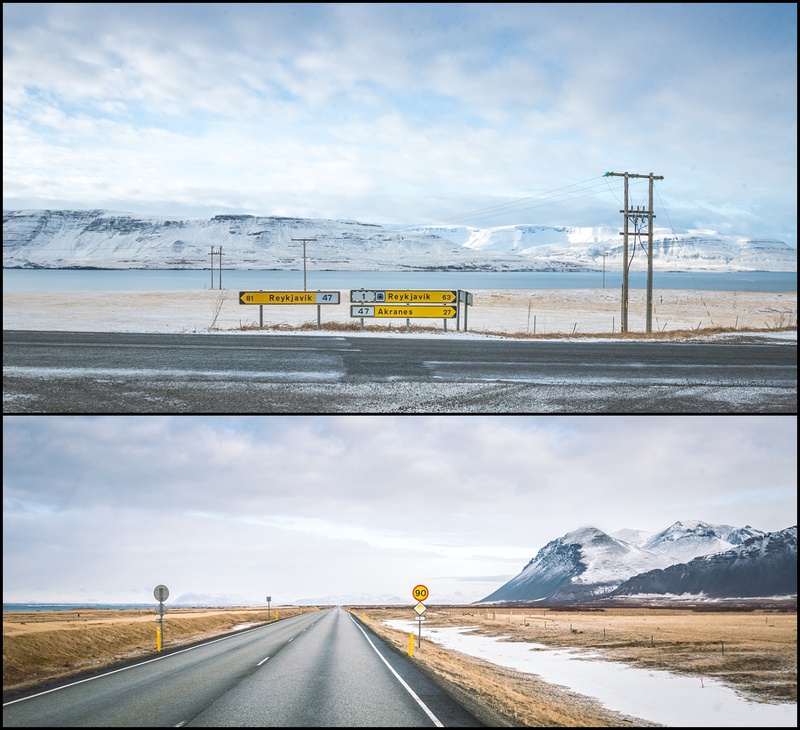 This seems to be a common occurrence in Iceland – town, road and highway names are duplicates, often thousands of kilometres apart and roads change name without turn-offs, or you turn-off and the road doesn’t change names. 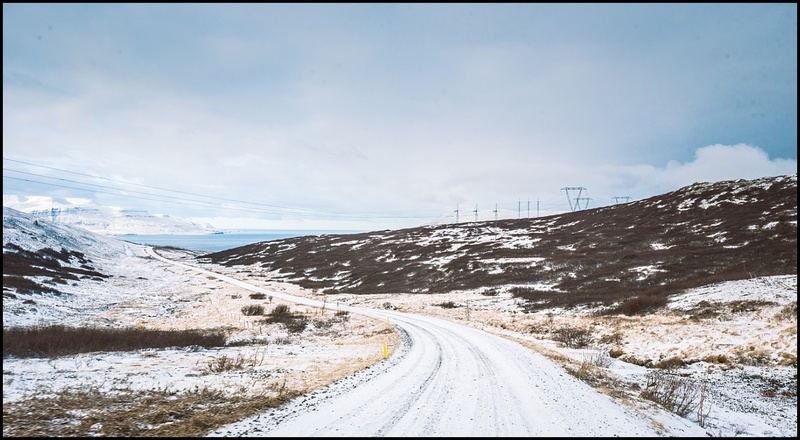 Once we had driven over this (admittedly stunning) piece of road 3 times, we gave up and decided we’d try to find somewhere in Stykkisholmur to at least park and eat. We then drove past a campsite that wasn’t chained off so went to investigate. The camp site wasn’t open but there had obviously been people and vehicles around so we stopped and made dinner. It was now after 8pm and the kids wanted to sleep rather than continue on for another hour or 2. Anto went to investigate and couldn’t find any sign of the camp being open and there was no water turned on, but there was power! So we went and parked and plugged in, figuring we might as well use site power for the night and save our gas. We were starting to get concerned about our water level, so again elected to skip showers for the night. At this point I was seriously regretting not having got up earlier and had a shower before leaving London on the Friday morning. 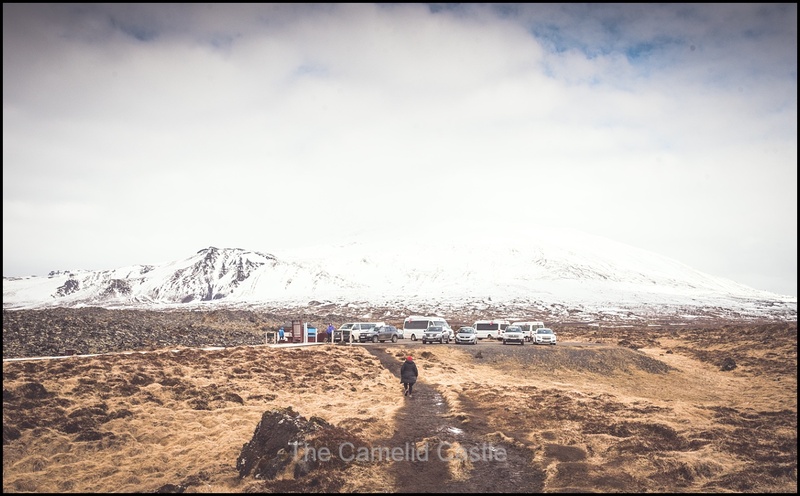 There were several other people in campers (in vans) pulling in looking for toilets and water, so we ended up with other campers nearby. We at least had our own toilet so were feeling smug at this point, glad again we hadn’t gone for a camper van and had the relative luxury of the motor home. The kids fell asleep quick smart, utterly exhausted and Anto and I re-did our maps for the next day (courtesy of 4G and fast internet in the motor home) and stayed up hoping for the Northern lights. Sunset is rather late and we had no luck with the aurora but did have another beautiful camping spot. 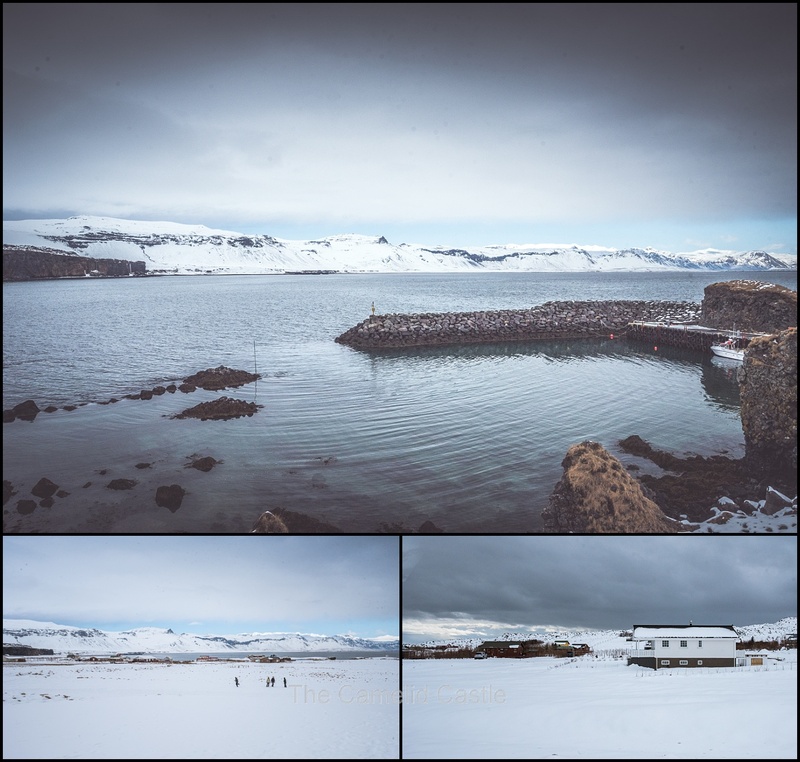 Stykkisholmur is situated on a peninsula on the Northern edge of the Snæfellsnes Peninsula, we were again in the middle of nowhere! 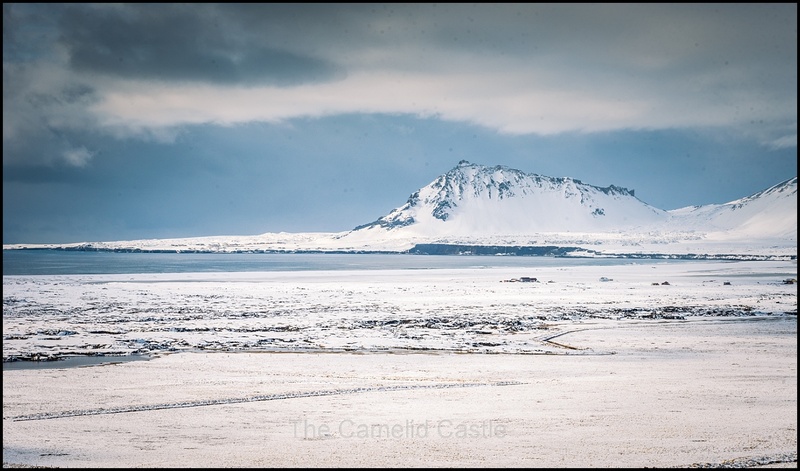 Daily statistics for Saturday the 7th of April, 2018 on the Snæfellsnes Peninsula in West Iceland – the temperature range for the day was minus 8 to 5 degrees, although the apparent temperatures were well below zero most of the day, with icy winds. We had several centimetres of snow overnight! The total walking for the day was 8.75km, a better effort than the previous day, considering the amount of driving. Most of it was in snow and ice so our legs were feeling weary despite the low number of kilometres! The total driving for the day was approximately 270km, although with getting lost at the end of the day there was probably an additional 40-50km on top. 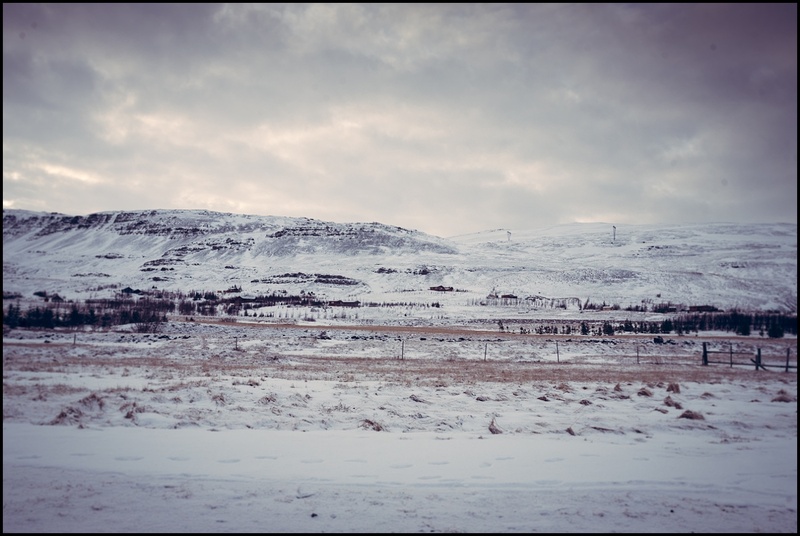 It was over 4 hours of driving time on Iceland roads and a lot of time reversing through snow in tiny car parks. 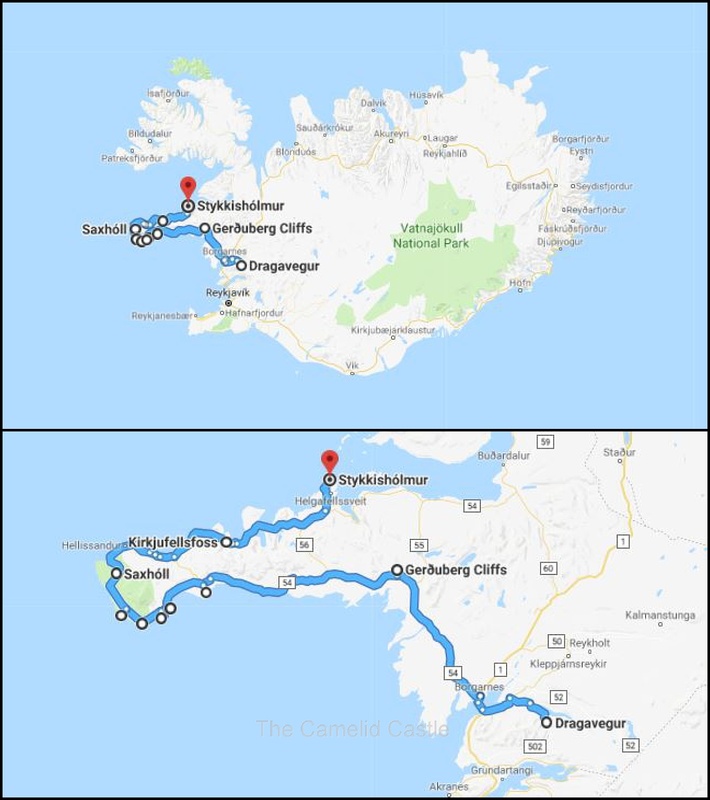 Here is a map of our driving adventures for the day, we started out in Dragavegur and headed around the Snæfellsnes Peninsula in a clockwise direction, finishing up in Stykkisholmur on the Northern edge of the peninsula to camp. 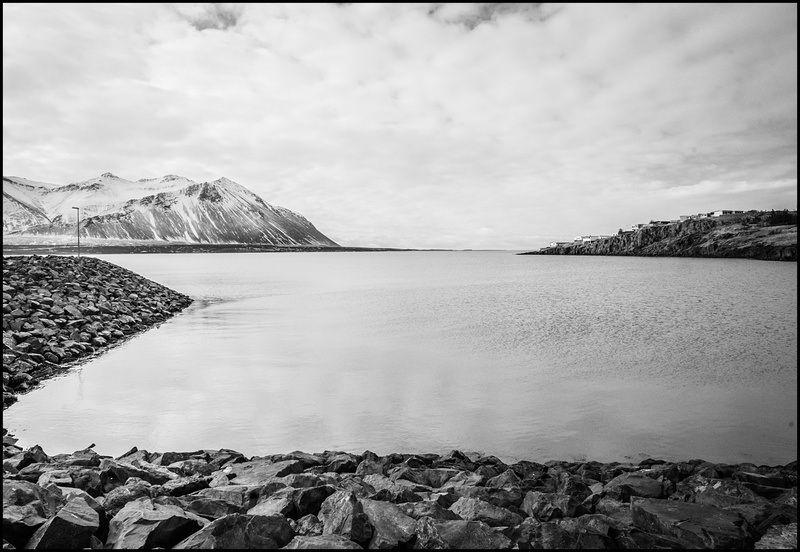 Up next, we continued our exploration of West Iceland and headed to the second largest city in Iceland, Akureyri, in the North of the country. 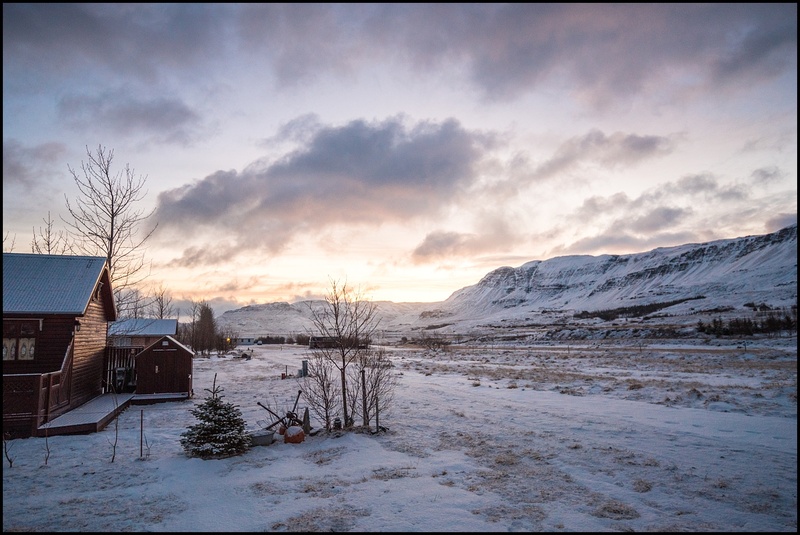 There was more spectacular and terrifying driving, snow, gorgeous horses and a visit to a local Icelandic hot spring pool in search of showers! 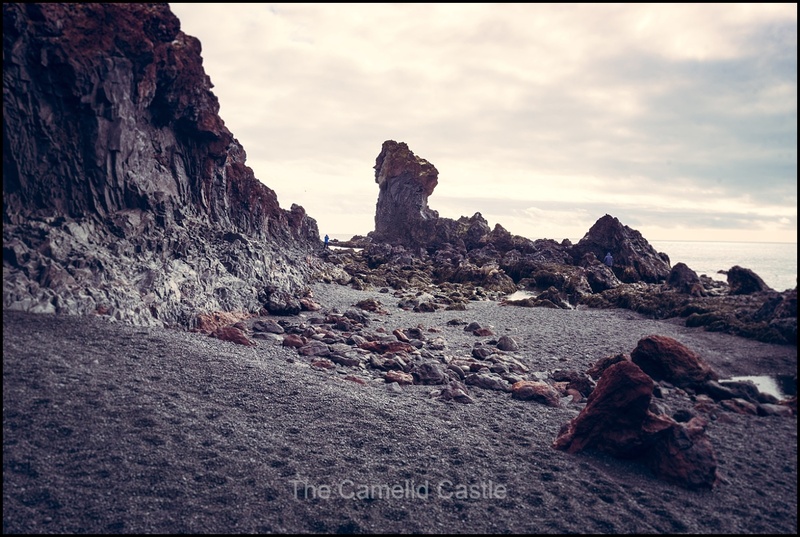 Posted in 4 years, 6 years, Anto, Arnarstapi, Astrid, beach, black sand beach, cliffs, crater, Djúpalónssandur, Europe, Gerðuberg basalt columns, Hellnar, Iceland, Iceland in a motor home, kids, Kirkjufellsfoss, lava field, lava formations, Lóndrangar, motor home, Saxhóll Crater, Snaefellsnes Peninsula, Snow, Soren, Stykkisholmur, sunset, Travel, travelling with kids, waterfall, West IcelandBookmark the permalink. Wonderful post and pictures! 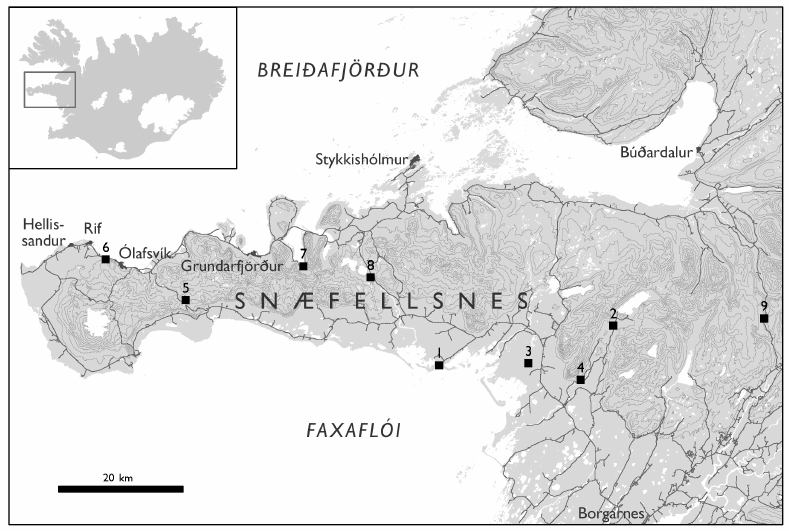 A great summary of the Snæfellsnes Peninsula.